Pork buns have become incredibly popular thanks to Michelin-starred chef David Chang who owns a bunch of uber-successful restaurants. 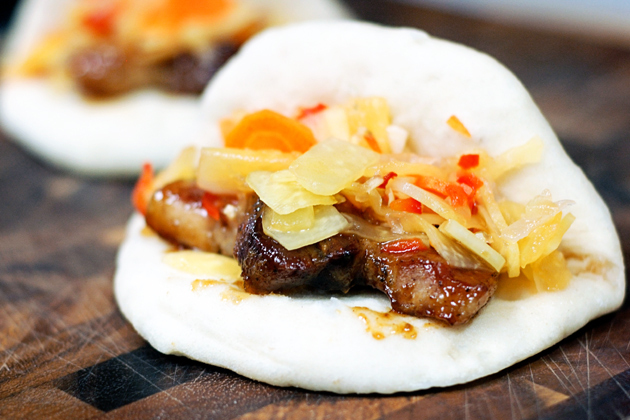 His first restaurant, Momofuku Noodle Bar and his signature buns have made him the undisputed king of pork buns. After reading all of the pork bun hooplah for quite a while I wanted to try my hand at them, but I've been more than a little intimidated given my serious lack of Asian roots combined with the fact that I have never had one. How do you know if you have made something right if you've never eaten it? 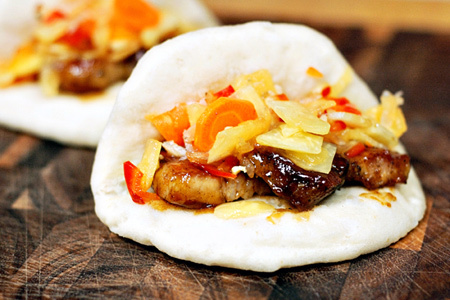 It's a big-time credibility killer to say, "Here, try my pork buns, they're great, I think." So, please join me, your blind guide, through the mean streets of Pork Bun Alley. You've been warned. The good news in all of this is that I recruited some help from the interwebs to avoid making a complete fool of myself. First was the buns. It's no secret in our house that I am no pastry chef. In fact, I often kid my wife (who can bake) by saying, "I'm a cook, anyone can bake." She replies with, "Everyone but you. ", to which I readily agree, albeit usually with an eyeroll. These buns come from an alternate and lazy-non-baker-friendly recipe from Jaden Hair over at Steamy Kitchen. She has a great blog and it's even greater when she teaches me how to make these buns from canned biscuit dough. Score! While I was reading her recipe I also decided to borrow her pork belly braising process, which worked beautifully. Thanks, Jaden. The Filipino influence in this experiment came from a friendly Filipina who works at a local store. I was there buying some sauerkraut and pork recently when she mentioned that if I love sauerkraut that I should try making pickled green papaya (atchara). I picked her brain a bit and she told me of a local Asian market where I could find green papaya. It was almost like she knew that I was looking for a funky twist for my pork buns. While perusing the web for atchara recipes I ran across many mentions of banana ketchup (yes, that is the proper spelling, so says me — with a K), which is the Filipino answer to tomato ketchup. It seems that there was a serious shortage of tomatoes during World War II, so they turned to, of course, bananas. What?! Oh well, bring on the banana funk! I'll try almost anything twice. OK, that's enough background banter. Let's get this show on the road before I'm tempted to get into the finer points of pork belly, or how they get the non-stick coating to stick to the pan. The atchara recipe makes about 2 quarts, and the banana ketchup recipe makes about 3 cups, so cut them if you think you won't use the remainder. I plan to use mine. It's best to make the atchara at least a few days in advance. I know this from my vast atchara experience. Put the cut papaya into a large bowl, toss with the salt and refrigerate for at least two hours, or overnight. Rinse the papaya with cold water and wring as much water as you can from it (in cheesecloth really helps). Return the papaya to the large bowl and add the bell pepper, onion, carrots, ginger, and garlic. Bring the vinegar just to a boil in a medium sauce pan. Add the sugar and stir until it dissolves. Add the pepper and chile, remove from the heat, and pour the liquid into the bowl. 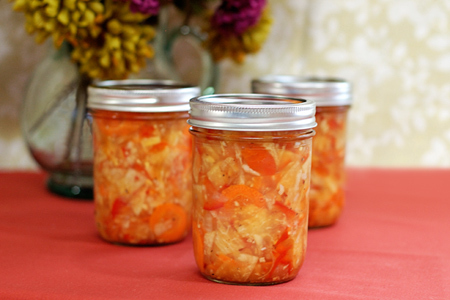 Toss the vegetables to coat well and portion into sterilized jars. Seal, let cool and refrigerate at least overnight, but preferably for a few days. Make the banana ketchup by heating a medium sauce pan over medium heat. Add the onions and cook until they are translucent and just starting to brown around the edges. Add the garlic and cook one minute longer. Add the remaining ingredients and bring back to a simmer. Blend until smooth with an immersion (stick) blender. Reduce the heat to a low simmer for 20 minutes. Portion into sterilized jars, seal, let cool and refrigerate overnight. 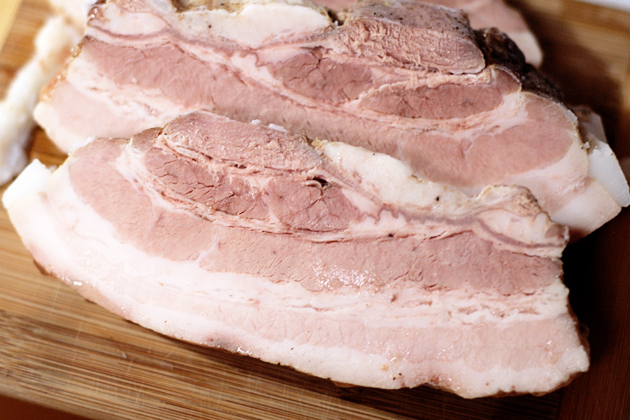 Several hours before you plan to serve (or the day before) braise the pork belly. Preheat your oven to 275°. Season all sides with the salt and pepper then wrap the pork tightly in a double layer of heavy duty foil, ensuring that you seal it well enough to prevent leaks. Cook the pork on the center oven rack for two hours. Remove from the oven and let cool wrapped for two hours then refrigerate. About an hour before you're ready to serve make the buns. Cut 10 4-inch square pieces of parchment paper and set aside. Flour your surface and roll each biscuit into an oval that's about 4 inches long and about 3 inches wide (at the widest point). Fold the dough in half, put it on a piece of the parchment and set aside. Repeat this process for the remaining biscuits. Put about an inch of water in a shallow wide pan (with a lid) and elevate a plate or rack in the pan (out of the water) so that it acts as a steamer. Bring the water just to a boil over medium-high heat. Working batches, steam the buns covered for exactly 12 minutes then remove with the parchment to a rack to cool. 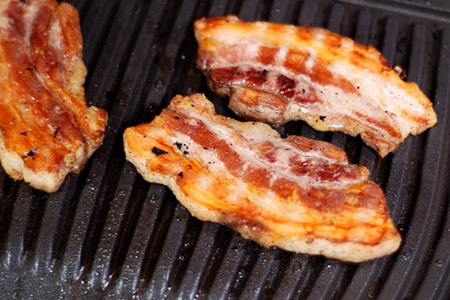 Start your grill and prepare for direct cooking over medium heat (about 300°). You could also do this in a wok or simply on the cooktop in a saute pan. 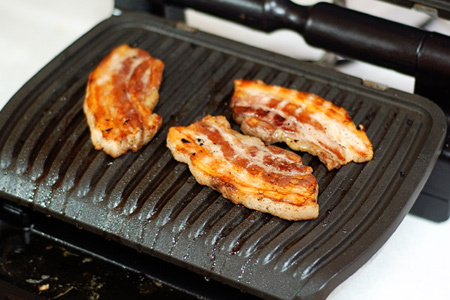 I used my new super-cool T-fal OptiGrill which I am reviewing reviewed. It worked really well for this application. Combine 1/2 cup of the banana ketchup and the hoisin sauce in a small sauce pan and warm over low heat, stirring occasionally. Remove from the heat and set aside. Unwrap the cooled pork belly and slice to about 1/3" thick and 3 inches long. 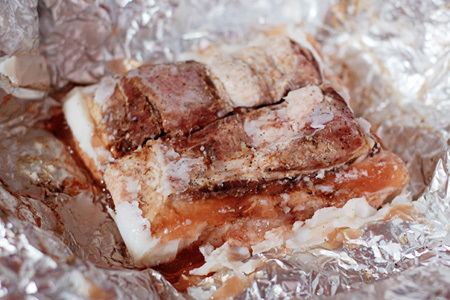 Grill the pork belly pieces until they are nicely browned. Remove the pieces from the grill and immediately brush each piece with the banana ketchup and hoisin mixture. Put two pieces of the pork belly into a bun, drizzle with some more of the glaze, and top with about 1 1/2 tablespoons of the atchara. Repeat with the remaining pork and buns. I'm a sucker for anything Asian, but this is over the top! Man does that look fantastic! This looks ridiculously great. I will be trying this soon!